Eagerly waiting for the time when you can put the engagement ring/wedding ring on the left ring finger of your love? Well, we understand the excitement and happiness you are experiencing at the moment. But have you ever thought as what might be the reason for putting the engagement/wedding ring on the ring finger of the left hand? Is it compulsory to put the ring on the mentioned finger only or you can put it on any finger you want? There are many such questions that have been raised by people. However, most of them follow the practice as being followed from generations without asking anything. What Greeks, Egyptians and Romans said about the tradition? It was in 2nd century Egypt that the ring placement on the ring finger in the left hand directed towards engagement followed by marriage. The Egyptians believed that there was an extremely delicate nerve which commenced from the fourth finger in the left hand (the ring finger) and reached to the heart directly. Infact the Greek scholar Appian also believed in the same theory as the Egyptians. It was after many centuries that the Romans too said the same thing, but with a little twist. Instead of the nerve, they believed that there was a ‘lovers’ vein, also known as vena amoris, which connected the finger with the heart, the main blood pumping organ in the body. During any engagement process of the Romans, the suitor would slip the engagement ring on the fourth finger of the bride-to-be. This symbolized that there will be control of a single person on the love vein. The tradition that the Romans started is still being followed all over the world. However, there are some places where some exceptions are seen. Though many say that the concept of wearing engagement rings and wedding rings on the fourth finger of the left hand came from Romans; many believe that it is an early Christian ritual. While in an orthodox church people should join their thumb with the middle and the index fingers. These fingers are representation of the father, son and the Holy Ghost. The ring finger symbolized earthly love and thus there could be no other finger that would be apt for placing the engagement ring and the wedding ring. 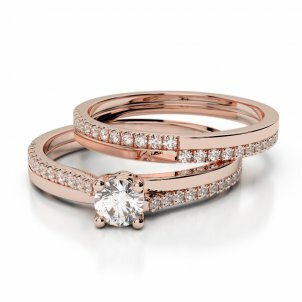 There are confusions regarding the fact as on which hand’s ring finger bridal ring sets should be worn. Majority of people following western culture prefer wearing the engagement ring as well as the wedding ring on the fourth finger of the left hand. On the contrary there are many people in the Americas and in Europe who wear the same on their right hand’s ring finger. Basically it depends on your choice as on which hands ring finger you will wear your engagement and wedding ring. One thing is obvious that on whichever hand you wear the rings, it will always symbolize your love and bond that you have for your spouse. It is a symbol of your union and that is the most important thing. Some celebrities are also getting tattoos done on the ring fingers and then slipping in the set of engagement and wedding ring.